In recent weeks I have been talking to groups — usually groups of REALTORS® — spreading the word that water (the lack thereof) is a serious issue. Certainly this is true in Austin and Central Texas. One measure that Austinites “get” relates to Lake Travis and Lake Buchanan, which supply virtually all of the water for Austin and Travis County. It’s one thing to read news reports about lake levels compared to mean sea level. It’s another thing entirely to understand that the amount of water stored in those lakes today is LESS than our annual usage in recent years! (835,000 acre-feet stored today vs. 880,000 acre-feet used per year.) With normal, minimal inflows and typical usage and outflows, most experts estimate that we have less than 2 years’ supply of water on hand. This is a statewide issue, though. I was in Midland a few months ago, where they have experienced tremendous population growth — monthly growth exceeding available housing units. At that time builders were stalled, unable to obtain water permits for new homes, and the housing shortage was real and very personal for hundreds of new Midlanders. If you have driven through South Texas you know that oil and gas production have exploded populations in normally small, quiet towns. I have sat through “rush hour” in places like Karnes City and Kenedy, where a traffic jam in the past would have been 3 or 4 cars. That growth has created the same kind of housing crisis that I saw in Midland, and is taxing water infrastructure designed in simpler times. In El Paso, in far West Texas, the situation has gotten so dire that the State of Texas has asked the U.S. Supreme Court to rule against the State of New Mexico over a 1938 agreement regarding the use of groundwater in and connected to the Rio Grande River. The claim is that New Mexico has permitted wells and diversion of surface water that have reduced the amount that reaches the Texas border below the contractually required amount. 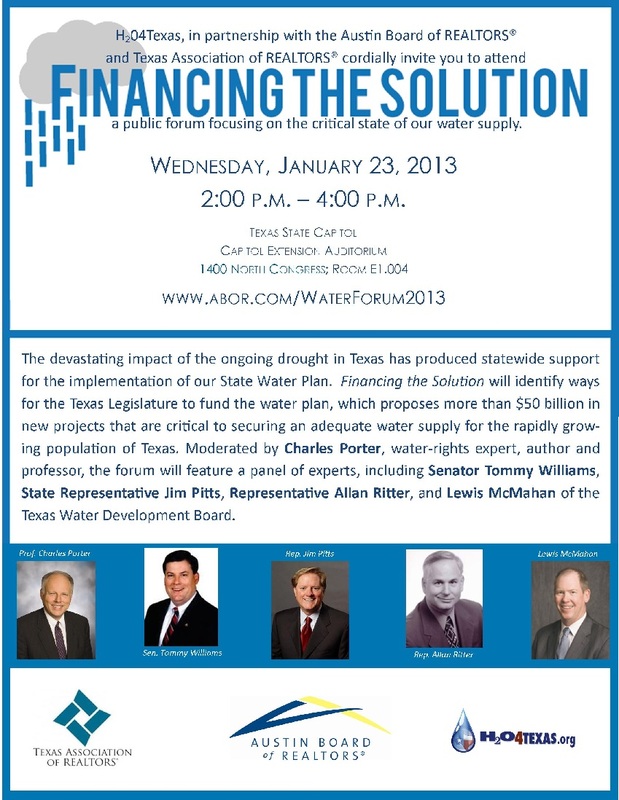 The Texas Legislature is back in town now, and water is getting a lot of attention. Then again, we got a lot of rain last week, so the crisis must be over, right? Absolutely not! Thinking of Austin again, what if Apple and Samsung had decided in recent months and years that they couldn’t trust Central Texas to provide the infrastructure necessary to support their growth? What if the next IBM or AMD or Motorola makes that decision in the future and moves somewhere else instead? What if growth continues, but builders can’t get building permits? Those are all real possibilities unless we take action now, during this Legislative session. Please join us. It will be a fascinating discussion, and all the legislators present will benefit from seeing how many people support this effort. I hope to see you there!